Elizabeth Orleans has created a series of ambitious installation works that include hundreds, possibly thousands, of elements that collaborate with the indoor environment. These architectural interventions penetrate boundaries and explore movement, change, and the infinite possibility of time. Elizabeth Orleans furthers the usage of her chosen medium, with ceramic works that are conceptually routed and skillfully executed. Her work at times can be seen as aggressive, imposing, and grotesque while simultaneously soft, beautiful, and sensuous, offering a dreamlike experience to the viewer. Already recognized as a talented artist she has been honored with exhibitions at the Museum of Contemporary Art in Santa Rosa, CA and at the Museum of Craft & Folk Art in San Francisco. 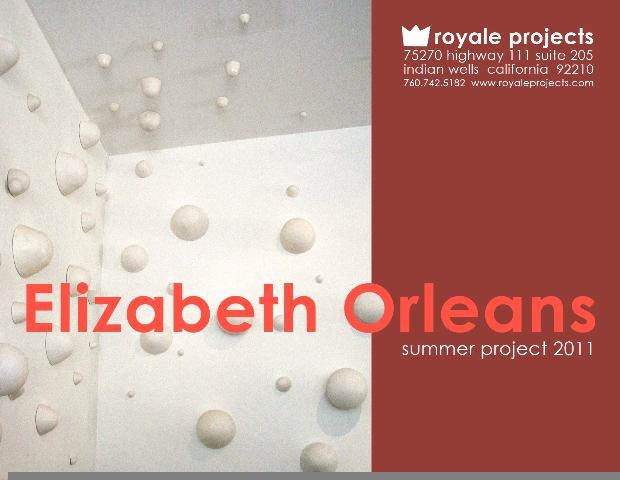 She was also recently selected to complete an installation at the internationally reputed collector, Susan Hancock’s Los Angeles art space Royal/T. This installation opens July 2nd and will continue to “grow” as the artist adds to and changes the works throughout the summer.